What Looks Old But Redefines New? Wooster And Mercer Lofts in Rosslyn. When you think of a loft space, you conjure up visions of high ceilings, old brick and big windows that actually function just as they did a century ago. Welcome to Wooster and Mercer Lofts where old is actually new, and new is truly spectacular. That’s why three sales in February alone bear out my assessment. Unit 309 in Wooster closed at $1,125,000 for a 2-bedroom, 2.5 bath residence with 1,914 sq. ft. In Mercer two loft spaces sold – Unit 502 commanded $1,000,000 for 1,691 sq. ft. with 2 bedrooms and 2 baths; while an almost identical second-floor loft sold for just $2,000 less! 130- and 140-year-old bricks from the now closed Capital Children’s Museum in DC wrap columns and support walls in all the units. Stunning floor-to-ceiling windows create airy and open living spaces under 10′ to 21′ ceilings. Kitchens feature maple cabinetry, honed granite counter tops and Wolf ranges paired with Sub Zero refrigerators. Baths feature double vanities topped with honed marble countertops along with oversized seamless glass showers and Waterworks fixtures. 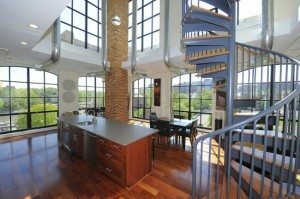 Penthouse units also boast upstairs family rooms that lead to private roof decks. 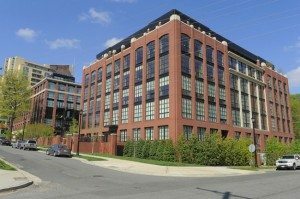 Located directly between Rosslyn and Courthouse, Wooster and Mercer Lofts are only minutes away from historic Georgetown, Key Bridge and a short metro ride to Washington’s business corridor, the Capitol and Ronald Reagan National Airport. You can walk into Clarendon where tons of shops and restaurants await or across Key Bridge into the heart of Georgetown for the city’s finest dining, shopping, theater and the arts. Wooster and Mercer Lofts are located between two Metro stops on the Orange and Blue lines, Rosslyn and Courthouse. It’s a great walkable location and there is always a ready supply of taxis at your doorstep. Access to DC, the beltway, National Airport and points beyond is easy with major thoroughfares within just a couple blocks. To visit Wooster and Mercer Lofts; or for a tour of the Rosslyn neighborhood or a particular luxury condo building, contact me, Jeff Wilson, at your convenience.